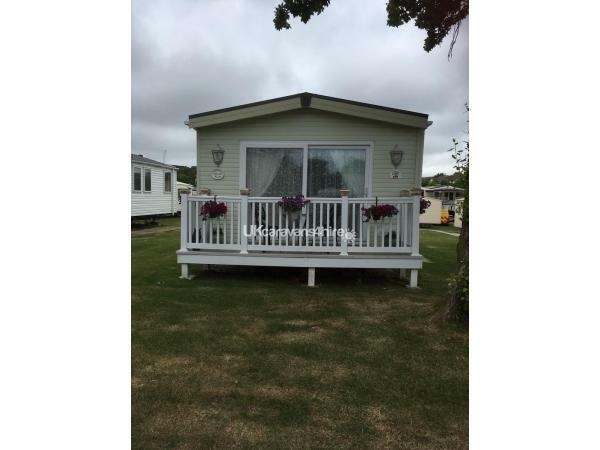 Additional Info: Step & decked to side of caravan with lockable gate & patio area with RATTEN furniture just been added. A £80 deposit must be paid at time of booking. The lead person Booking there holiday is Responsible for there party .The Deposit is returnable if no damage, loss or breakage has occurred including soiling of carpets, curtains, bedding etc and keys returned and is left as you would wish to find. Returnable deposit will be refunded within 7 days of departure. Payment of holiday must be paid 6 weeks prior to your chosen holiday due date, please ask I accept Payment plans to spread the costs,if full payment is not recieved 6 weeks prior to your holiday, I have the right to cancel your holiday and deposit will NOT be Refunded. 3/4 night stays available but not in peak season. 7 night stays only in peak times. KITCHEN is Fully equipped from Tassimo to a 8kg Washing machine.TEA TOWELS,washing up liquid ARE ALSO INCLUDED. Veranda has table & chairs,and has lighting to the front on veranda area & entrances of the caravan. Parking is directly in FRONT of Static. Ideally located on the park and close to all amenities. PAPA JOHNS PIZZA WILL ALSO DELIVER TO THE CARAVAN if you just want a quiet night in & relax. ENTERTAINMENT PASSES ; ARE NOT INCLUDED IN THE PRICE,AND CAN BE PURCHASED ON DAY OF ARRIVAL; You will also be allowed to use Weymouth bay's sister Park SEAVIEW next door with your passes. A excellent bus service runs from outside the park on a half hourly basis's if you decide to leave the car behind to go into Weymouth.